From Frozen deep fry at 350 º F for 4 - 6 minutes or Until Internal Temperature Reaches 165 ºF as Measured by Use of a Thermometer. Or, From Frozen bake in a Pre-Heated 350 ºF Convection Oven for 10 - 15 minutes or Until Internal Temperature Reaches 165 ºF as Measured by Use of a Thermometer. Serve hot with Tamarind Chutney. 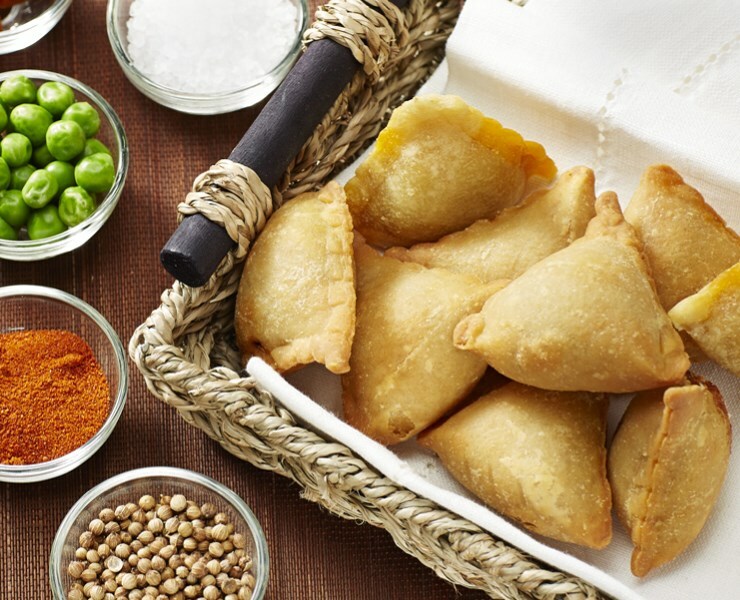 A mainstay delicacy, originating in the Middle East, samosas provide an intense flavor profile inside a crisp, distinctive triangle-shaped pastry. With continued requests for more authentic ethnicity flavor profiles, Kabobs Punjabi Chicken Samosa captures the look and flavor of Indian inspired samosas. Consisting of shredded chicken breast, mixed with fresh shucked garden peas, diced potatoes, and accented with cilantro, ginger, mint and an aromatic blend of herbs and spices. These miniature samosas are perfect as-is, or pair well with a sweet and tangy tamarind sauce or a green chutney. These miniature samosas are perfect as-is, or pair well with a sweet and tangy tamarind sauce or a green chutney.